I really love your style! Beautiful dress <3 Happy weekend my dear! 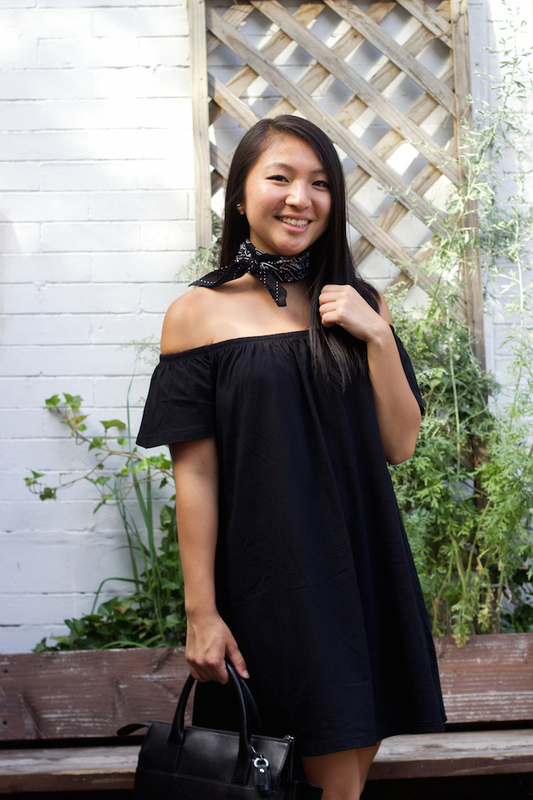 Loving this off the shoulder black dress. Beautiful styling! The neck scarf looks very chic! I love how you wore a bandana and some white sliders. Very cool ! Hope the start of your long weekend has been great! I can't wait to get mine underway. Love your dress too! This outfit is just perfect from head to toe! I adore the bandana and off the shoulder combo! I wasn't actually looking forward to the weekend cos every day is a weekend for me until the end of August, :). You look so lovely babe, I love a black look in the summer when everyone expects us to style bright colors. Have a lovely 3 day holiday, Christina! Can't wait to see how you spend it! Loved this outfit when I saw it on IG! The scarf thingy looks soo good on you! I've been wanting to try that trend but don't know if I can pull it off like you! Simple but cute dress, i like the a scarf add-on. Looking pretty girl. such a beautiful black off shoulder dress. Gorgeous as always and enjoy! can never go wrong with black and white!! awesome as ever! hope you had a great long weekend! I love the scarf in this outfit, the black and white are perfect!